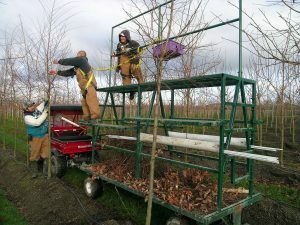 Nursery Production – Urban Forest Nursery Inc.
Over time, the nursery’s growing practices have evolved and matured. For example, the company initially planted both branched and whipped liners, but eventually moved toward working exclusively with whips, as it is much easier to prune and establish the crowns on whips, to ensure the crowns are high enough to be used as street trees. In the beginning, nearly all of the trees grown on the property were balled and burlapped, and everything was planted and harvested by hand. Eventually, we knew we either had to move forward with a mechanical tree spade or choose some other harvesting method. In doing so, we researched and analyzed different production methods, and decided to give grow bags a try. When we first started using grow bags, we were not particularly impressed. Some of the trees were growing too large for the bags they were in, and there were some fabric specification inconsistencies, which did not permit the necessary root growth through the bag. However, we soon understood that if we could get the timing correct by harvesting the trees before they became too large, and if the supplier worked out the fabric issues, there were actually significant advantages in using this method. Below are some specifics on grow bags and other production methods we use at Urban Forest Nursery, Inc..
First, grow bags produce smaller, more concentrated root systems, which makes digging less laborious. The process begins by planting root pruned liners into the grow bags, making sure the roots do not touch the sides. New roots then grow into the bag fabric, but are restricted by the material, preventing the curling circling root that happens with some other production methods. This creates larger and more prolific roots inside the bag. Second, essential roots are not removed during the planting process. 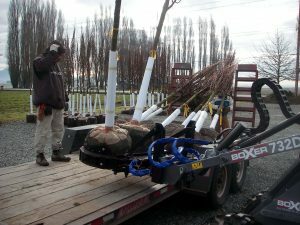 When trees are shipped to contractors, all they have to do is cut the bags off to expose the root tips and plant them. With other growing methods, new roots are often established beyond the rootball area with that portion of the root system “chopped” off during harvesting. Third, grow bags make it possible to harvest our trees any time of the year. Because the majority of roots remain in the grow bag, and only smaller absorbing roots grow into the surrounding soil, the nursery can dig year round, and in almost any kind of weather – including deep snow! When the trees are unearthed, the majority of roots remain in the bag. Finally, grow bags make it easier for us to ship larger quantities of tree stock in the same amount of shipping space. 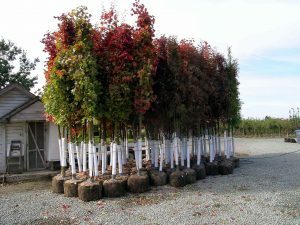 With compact rootballs, which both weigh less and take up less space, we are now able to pack many more trees onto a single semi for shipping to customers in Washington, Alaska, and western parts of Canada. We have found that planting trees in grow bags is initially more laborious and time consuming than traditional planting methods; however, the harvesting is much faster and easier than other mechanical or hand balling methods. Overall, the advantages of using grow bags outweigh the more time consuming planting process. The grow bag method has worked very well for us, and now we grow close to two hundred different varieties of trees in them. As with most nurseries, the busiest time of year for us is the spring planting season, which typically begins in February and continues through May. Some planting is also done in the fall, shortly after the fields are tilled and fumigated, readying the grounds for production. 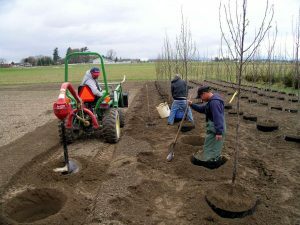 Approximately 6,500 trees are planted annually, a significant increase over the small number we were planting when the nursery was first established. Over the years we have devised a strategic field layout that suits our tree-growing operation. We lay out the field with trees spaced three, four, or five feet apart, depending on the variety, in rows that are eight feet apart. Holes are then drilled using 18- to 21-inch diameter augers. We then use a plastic cylinder spreader to open up each bag so we can fill it half way with soil, put in the tree roots, backfill more dirt and then pull out the liner. Another innovation to our field layout was to slightly elevate the grow bags above the surface grade of the ground, then berming the soil with a disc in the rows over the bags. This surrounds the grow bag with soil, but because it is above surface grade in the berm, the entire root system remains slightly warmer with continual positive drainage. 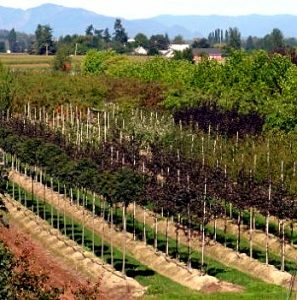 Proper moisture and a concentrated root system is maintained by the drip irrigation system flowing to each tree that is planted. Once all the trees are planted, they are staked with a metal or fiberglass stake. Most of the varieties are tipped at six to six and a half feet to develop the primary branch structure. A new sprouting lateral branch is then taped on the top of each tree to train the new leader. Strong lateral limbs are stimulated to grow just below this tipping. This is a critical pruning and training technique to get the branch structure to develop at the proper height. In addition, trees are pruned one to three times a year depending on the variety. Many nurseries do not train the primary branch structure to this height because it can take one to two years longer in the nursery. A custom-built pruning cart makes this jobs more efficient, safe, and convenient. We designed the unit outfitted with adjustable platforms that allow workers to raise or lower each one as they approach branches of varying heights. To create even more efficiencies, the cart was built large enough for four people to use at the same time. A four-wheel drive Kawasaki Mule pulls the unit between the rows. Trees are sold when they are between 1.5” and 4”caliper, with the average being 2” caliper. They are quickly dug by tractor with a customized fork and the tops of the bags are tightly covered with burlap for a solid compact package. They are moved from the field on the tractor or tracking trailer. Another innovation used at Urban Forest Nursery is an Italian-made tractor called a “Boxer” that has a telescopic loading arm attachment. We wanted to minimize the potential for any of our workers getting injured, so we purchased an articulating tractor and added a modified grapple for loading semis, trailers, and trucks. 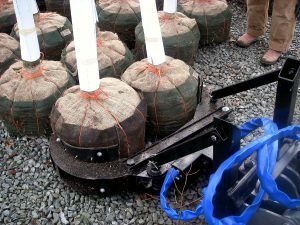 The customized grapple makes it possible to pick up two smaller or one very large grow bag, move the trees, and then load them without a laborer touching the tree. The tree crown can be pivoted forward to accommodate loading a box trailer and the tree can then be dropped into place without manual lifting in most cases. With creative growing methods and inventive equipment in use, we have tried to create a niche for our company in the Pacific Northwest. We have plans in place to become even more innovative and efficient in the future, including our new RFID inventory management program to provide our customers with real-time inventory availability. Our inventory is now viewable HERE. We plan to continue making process improvements year-after-year, in an effort to always provide the best possible product for our customers.